What could be more fun for a kid than learning how to fish while spending a week at summer camp? A special week-long overnight session (July 31-August 5, 2011) at Barry Conservation Camp in Berlin, N.H., gives youth -- boys and girls ages 10-16 -- the chance to become better anglers as they work with trained Let's Go Fishing staff and volunteer instructors. Novice anglers will learn the basic skills and equipment needed to get started fishing, while campers with more experience will work on improving their fishing skills and exploring the finer details of the angling world. Cost for the week is $475. Youth under age 16 in New Hampshire don't need a license to fish, so come along and learn how to catch the big one! 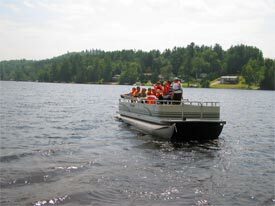 To sign up for the Fishing Camp week (also known as Aquatic Adventures/"Let's Go Fishing") or other 2011 summer programs at Barry Conservation Camp (listed below), go to //extension.unh.edu/4H/4HCamps.htm or contact 4Hcamps@unh.edu or 603-788-4961. Barry Camp is a weekly, overnight summer camp operated by the UNH Cooperative Extension 4-H Program and the New Hampshire Fish and Game Department. It's a great place for kids to have fun while learning about outdoor skills and the natural world.